The month of September ended warmer than average overall, and the warmth was generally persistent throughout the month. With the exception of four below average days around the 10th, which featured a few days with highs in the 70s, every day was above average except three. In fact, nearly half the month (14 days) featured highs at or above 90°. This is nearly a week of 90° days above average. 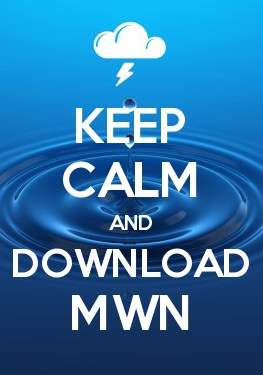 No records were set, but Memphis did reach 95 twice in the third week of September. Precipitation was also fairly abundant in September with nearly 3 inches falling at the airport from the 7th to 9th and additional rainfall totaling nearly 2" from the 23rd to 25th. Flood Advisories were issued for the metro on the 8th due to heavy rainfall from thunderstorms, though no reports were received of flooding. There was no severe weather during the month. Comments: Fourteen days recorded high temperatures at or above 90 degrees, which is 6.3 days above average. Comments: Four days recorded more than 0.5" of rain. The October climate outlook for the United State from the Climate Prediction Center is shown below. Temperatures are forecast to be above normal for much of the southern and eastern United States. 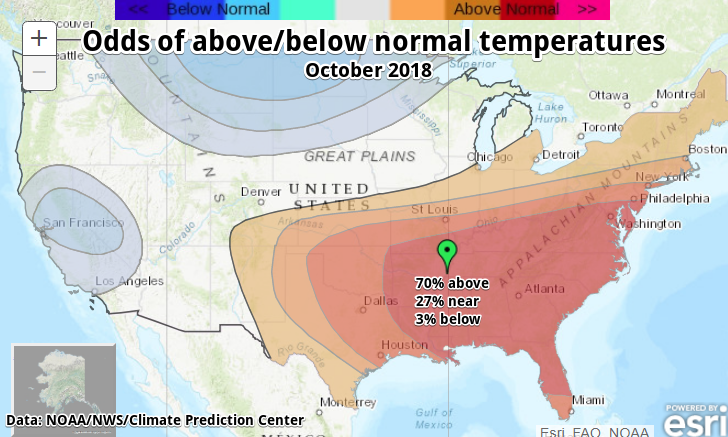 For Memphis, odds of above normal temperatures in October are 70%, near normal 27% and below normal just 3%. Memphis typically averages just 64 degrees for the month of October, or about 14 degrees cooler than the September we just experienced. A wet October is forecast for much of the United States with the exception of the Pacific Northwest and eastern seaboard and southeast. 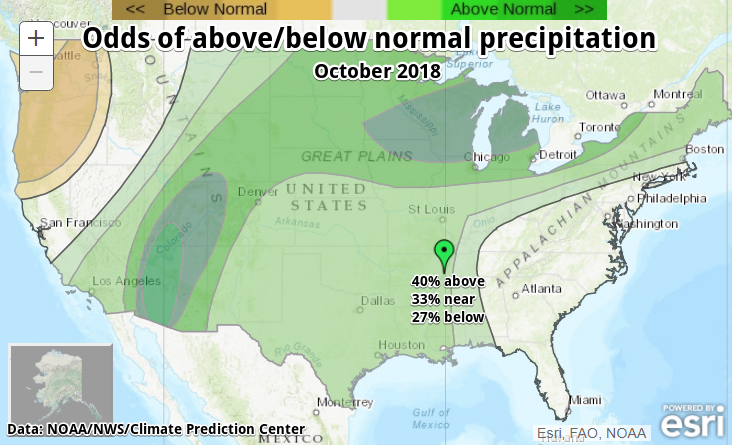 For Memphis, odds of above normal precipitation in October are 40%, near normal 33% and below normal 27%, or not far from equal chances of above/below. October averages about 4" of rain in Memphis.